Osa Conservation featured by The New York Times! Osa Conservation has recently been featured in a New York Times article that highlights our Wildlife Monitoring Program. Our extensive monitoring program captures images of wildlife and their prey in order to research their abundance within Corcovado National Park, Osa Conservation properties and other private landowners and partners in collaboration with the National University of Costa Rica (UNA). 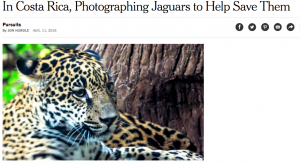 These images tell a story; they helped bring to light that the estimated fifty jaguars (a 2005 estimation) that were found in the Osa Peninsula has dwindled down to between an estimated ten and twenty. To get the full scoop, to read the full NYT article.